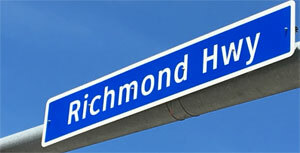 Take a good look at the Richmond Highway corridor because it will change. This dynamic commercial corridor is slated for widening, adding a Bus Rapid Transit (BRT) system, and has been rezoned for additional commercial development. The past 10 years has seen remarkable re-development in the larger retail centers and additional housing options becoming available. The next 10 years will transform the area. Mount Vernon Lee Chamber’s vision for this area is a vibrant community enriched and supported by strong businesses. The chamber is a stalwart champion of business and works with our members and other partners to build a community where businesses thrive. New and enhanced options in transportation, housing, education, tourism and health care will make this area more attractive for businesses to locate here. Businesses bring vitality to a community and strength every part of the local fabric. Here are a few changes coming to our area. Starting at the Beltway, the area around Huntington Metro will see a re-development of Riverside Apartments into its own town center with an addition of five new mid-rise multifamily buildings to the existing three apartment buildings with a pedestrian friendly street grid. All this plus new trails along Cameron Run and canoe/kayaking facilities. Also on Huntington Avenue, the Huntington Walk Condos will be re-developed. According to the plan, the developer will tear down 364 condos and replace them with more than 1,500 condos and apartments, 65 townhomes, and retail and office space. The tallest buildings will be located near the Metro station and are planned for 200 feet going down to 55 feet. Completing the plan will take about 10 years with development closest to the Metro starting first. Initial funding has been approved for Phase I of the Bus Rapid Transit (BRT) system which will start at the North Kings Highway entrance of Huntington Metro, and follow North Kings Highway to Penn Daw where it will enter Richmond Highway and extend to Hybla Valley near Mount Vernon Plaza. Phase II will continue the system to Fort Belvoir. This project will transform the northern part of Richmond Highway as the road is widened to accommodate the bus lanes in the center of the road. The design of Phase I is planned to be completed by 2022, with construction tentatively scheduled for completion by 2026. While the northern section of Richmond Highway will change with the BRT, the southern section will be widened and modernized from Jeff Todd Way to the Costco. The widening will be three lanes in each direction, new intersections, and a median to accommodate the BRT. VDOT is finishing the design for this project and will begin acquiring right-of-way and moving utilities in 2019. Construction should begin in 2023. In addition to the transportation improvements, the National Museum of the United States Army at Fort Belvoir is under construction with the opening planned for 2020. The 185,000-square-foot-museum space will house more than 1,300 artifacts, documents and images that will be selected from the Army’s total collection of 630,000 items in order to tell the stories of American soldiers. Adding the Army Museum to George Washington’s Mount Vernon, Gunston Hall, Woodlawn Plantation, the Workhouse Arts Center, and other smaller attractions makes this area the tourism destination for all of Northern Virginia. Additional amenities will be added to make the area even more attractive for visitors like new restaurants, bike share and dock-less bikes, and walking and bike trails and important transportation improvements. Mount Vernon Lee Chamber will continue to work with our partners and bring changes and growth that benefits the community.